Zach Condon is quite an accomplished songwriter (and singer and multi-instrumentalist) already at such a young age. The barely 21-year old has already put out a solid debut (2006's Gulag Orkestar) and an even better although short EP (also 2006's Lon Gisland) all under the name Beirut. Neither of those albums are as fully realized as The Flying Club Cup, which came out in stores today. His finest work to date seems to be more of a full band effort. 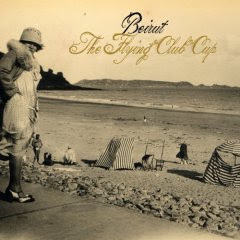 If you aren't familiar with Beirut they mix Eastern European Gypsy with folk and pop music. Condon's voice is one of the more captivating in music today, it just fits perfectly with Beirut's music stylings. I'm horrible at describing music to people so you just got to trust me, this is one of the best records of the year.